@Frank and I were discussing his new article for the English magazine, it's about smiling, and we got to talking about eyebrows and how they can be used to express emotion. I found this interesting article Frank. Thank you for a very interesting article @Lynne. I have to say I am bemused by this fashion. There was a girl in my Italian class a few weeks back who'd done this to her eyebrows. In my opinion it looked rather odd and whilst she was quite attractive, she would have been much more beautiful with 'normal' eyebrows. Some girls I've seen look positively hideous with them. And this is before it starts raining! It's all the rage in Asia and many other places too. To be honest I think it looks a bit vulgar rather than beautiful, but that's probably me just being old fashioned. There's a lot of useful information in real eye brows that must be lost by shaving them off. Actually it's the not the mouth that makes the smile, but the eyebrows. Now put your thumb on the eyebrows on these pictures and you see the normal "smileys" for happy and sad. Then take your thumb away again and the emotion looks quite the same in both pictures: a bit grumpy. People tend to look at eyes to see how someone feels. We don't look at the mouth that much. That a smiley looks like a smile is programmed in our minds just as we see happiness in a dog's wagging tail. In terms of communication shaving away your eyebrows is terrible. However, if the girls pencil in their eyebrows at the same place as where they shaved the original one, it doesn't matter that much. Then they make use of the same muscles they use with their hirsute eyebrows to convey their emotions. I love it when I look into twinkling eyes @Frank. 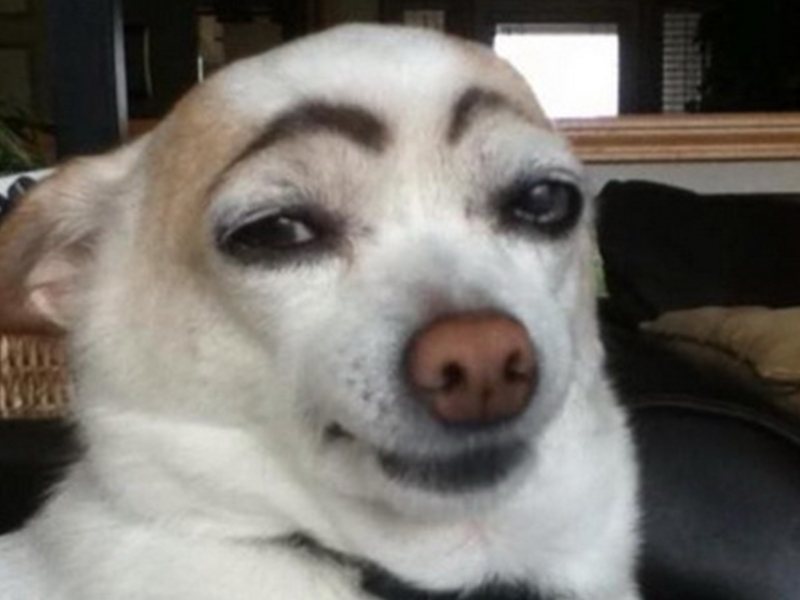 That eyebrows speak a language is certain, even a dog understands this language. If our dog something does what I don't like, and I just look at him with strong stretched eyebrows, he stops immediately and drops down the tail between his paws because he understands that I disapprove of his behavior with an ordinary eyebrow movement. It's funny how animals pick up on human body language. I think animals not only understand what's happening, but have their own body language. I think England has some very strange ideas about eyebrows, and it always makes me wonder what might be coming next! If you need convincing that England is strange, Google "feather eyebrows"! A friend muttered 'What is the problem some people have with hair?'!' when I told her about it. I think shaved eyebrows aren't in fashion, and mine opinion is that eyes more say than eyebrows, but the eyebrows move together with our eyes or some people speak with many motion expression on their face. I have so a girlfriend who speak with everything on her face! I always have to laugh of this. The perfect brow will make you look fresh, rested, young, healthy, and overall, more attractive. You're right, you see it at the dog too. It's only a joke! Some girls seem to overdo it sometimes @Saira by plucking their eyebrows almost to extinction. You might look younger, but you will look pretty stupid. You are right @mheredge and @Michouxe, I think eyebrows are very important part of your face if you change their shape your whole look changes. @Lynne, the other week @Shiny03 made an interesting comment about Japanese people and smiling. (SHe said that they tend not to very much). Now I know why Japanese people look so young! A new info for me. Eyebrows decide the type of emotion! I will observe it and share my experience with you. Interesting stuff! The first smiley face looks positively mischievous, don't you think @Bubbly? It's amazing when you see the difference that eyebrows can make for people. It can transform your face, and turn you almost into somebody entirely different! I'm not sure about mysterious @Bubbly, but I do wonder what he is smirking about. It is said that the quizzical raising of eyebrows is supposed to be attractive. I agree with you @mheredge this trick were use by many students at the oral exams when the students stayed the answer guilty. I think the students tried to charm the teacher with this. '...when the students stayed the answer guilty'? What do you mean by this @Paulette? Do you mean when the students did not know the answer? Yes @mheredge this is an idiom that we use in Dutch "staying the answer guilty"
That's an interesting phrase to use. It's not one that we use in English, and I am not sure what the nearest idiom that we have would be! That's interesting. I am not sure they would be able to tell much about the destiny of British people from their eyebrows though - as half of us shave them off and then draw them back on with a pencil! > That's interesting. I am not sure they would be able to tell much about the destiny of British people from their eyebrows though - as half of us shave them off and then draw them back on with a pencil! Are so many girls shaving off their eyebrows in Britain @GemmaRowlands? I saw it a few times in Asia, then there was a British/Italian girl I met in Italy and I saw a few examples in London when I went a few months ago, but I have not seen anyone here in France with shaved off eyebrows, or anywhere else in Europe for that matter. Maybe not a majority, but there are a lot who do that, particularly where I live. We're famous for it! I don't do it personally, though. I like mine the way they are.